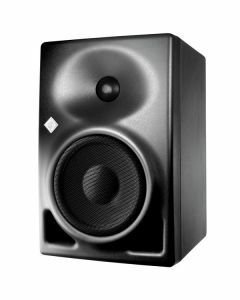 The KH 120 D studio monitor is designed for use as a near-field loudspeaker or as a rear loudspeaker in larger multi-channel systems. The KH 120 D is perfect for tracking, mixing and mastering in music, broadcast, project and post-production studios. The KH 120 D studio monitor is designed for use as a near-field loudspeaker or as a rear loudspeaker in larger multi-channel systems. The KH 120 D represents the latest in acoustic and electronic simulation and measurement technologies to ensure the most accurate sound reproduction possible. It has a Mathematically Modeled Dispersion waveguide (MMD ), flexible acoustical controls, analog class-AB amplifiers, various input formats (analog and digital) and an extensive mounting hardware range. All of this provides the user with the maximum versatility over a wide variety of acoustic conditions, source equipment, and physical locations. The KH 120 D is perfect for tracking, mixing and mastering in music, broadcast, project and post-production studios. Infrasonic filter frequency; slope: 30 Hz; 6 dB/oct.